As the United States marks the anniversary of the attacks on September 11, 2001, the last known living rescue dog that participated in the post-attack recovery efforts that day at Ground Zero has been honored in New York City. Bretagne, a golden retriever, and her handler, Denise Corliss, were with Texas Task Force 1, one of around 100 urban search and rescue teams that searched for survivors and victims after the attacks. "Responding to the World Trade Center was our first deployment," Corliss told BarkPost, which sponsored their trip. "We were there to try and find survivors. When our task force arrived at Ground Zero, I just couldn’t believe the magnitude. And then I looked down to her, and she seemed stoked and ready to work. "Toward the end of our mission, it changed from a search mission to a recovery mission. I was just so grateful to have a canine partner that helped me get through it." Bretagne and Corliss made the trip to New York a week ago. The 16-year-old dog received a lot of pampering, including a suite at 1 Hotel Central Park stocked with dog treats, a specially prepared doggy burger and a new bed and toys. 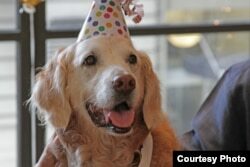 She was also given a full blown “Sweet 16” birthday party complete with gifts and a cake made for dogs. At Times Square, a huge billboard featuring a photo of Bretagne and Corliss was erected and read, "NYC welcomes you and your mom. Thank you for both your services." During a walk at Hudson River Park, Bretagne was given a “bone to the city,” the canine equivalent of the key to the city. The bone was made by Tiffany and Co. Friendly New Yorkers also offered lots of affection and thanks to the elderly dog. Bretagne, who also worked in the aftermath of Hurricane Katrina in New Orleans, is now retired, but still visits schools to help promote reading among children.